Fall is in the air and seasonal fruits and veggies like pumpkins and apples are available once again in grocery stores, farmer’s markets, and CSAs. If the season makes you think of warming spices like cinnamon or curry, you’ll enjoy whipping up these 5 delicious plant-based recipes that make the most of autumn’s bounty. This moist, golden-yellow cornbread is a great accompaniment to a veggie stew or chili, or just served hot with honey butter. 1 cup pumpkin puree (either canned or make your own by roasting a split pumpkin with cut sides down at 350 until soft – about one hour – then scoop out puree and mash it). Preheat the oven to 400 degrees Fahrenheit. Mix the dry ingredients together in a large mixing bowl (flour, salt, cornmeal, baking powder and baking soda), then make a small hole in the dry ingredients. Add the wet ingredients into the hole (eggs, olive oil, honey, pumpkin puree, milk) and gently mix together the batter. Finally, fold in the corn kernels. Turn the batter into a greased cast iron skillet and place in the 400 degree oven. 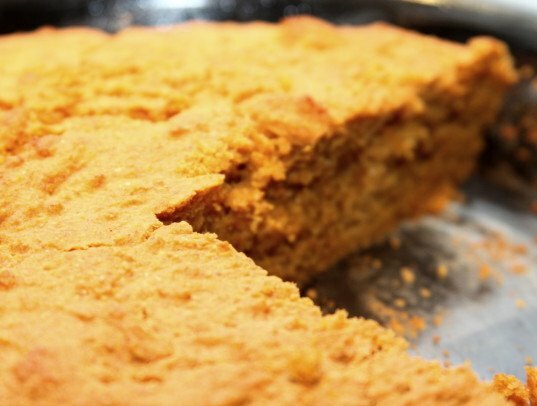 Bake for about 30 minutes, or until a toothpick inserted into the cornbread comes out clean. Juicy apples and spicy ginger make a fantastic combination. 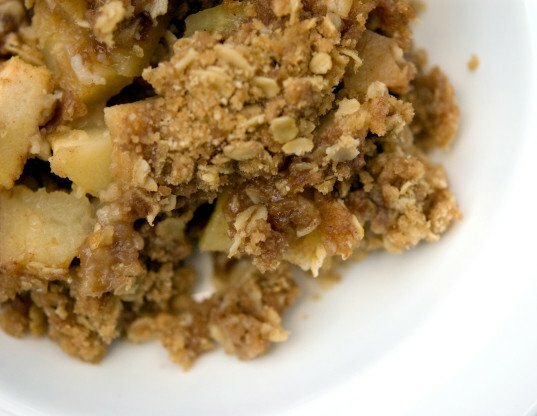 This quick and easy crisp recipe is perfect to whip up for a dessert after a fall meal. Serve with vanilla-bean flecked whipped cream or vegan coconut ice cream. Preheat oven to 375 degrees Fahrenheit. In a bowl, add dry ingredients (flour, oats, spices, salt, sugar) and mix. Using a pastry cutter or two butter knives, dice the cold butter or spread into the dry ingredients until the mixture begins to resemble a dry crumbly mix with small pearls of butter coated in the dry ingredients. Grease or butter an 8×8 inch square metal or glass baking dish. Pour the apples into the dish and squeeze a bit of fresh lemon juice over them. Sift the dry crumbly mixture evenly over the apples. Bake the crisp at 375 for about 35 minutes, or until the crisp begins to turn brown and the apples are softened. This warming golden soup has just enough spice to kick up your metabolism and keep you toasty on cool fall nights. Savory Thai spices combine with buttery squash for a hearty soup that you can turn into a meal by serving with a side of rice. In a large soup pot, sautée red curry paste, ginger, onions, and garlic in olive oil. Once softened, lower heat and add 6 cups of water and the 2 bouillon cubes (or paste). Mix until dissolved. Add the squash and can of coconut milk (reserving three tablespoons) and stir. 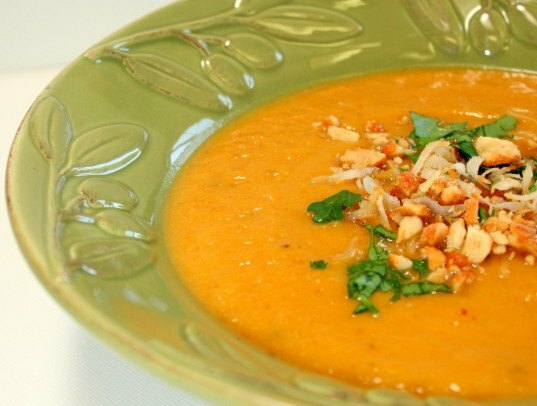 After cooking for a 1/2 hour, use an immersion blender to puree the soup (or puree in batches in a blender). Add salt to taste, mixing well. Ladle into serving bowls and drizzle with the reserved coconut milk, then top with a sprig of cilantro. Love the tang of pickles and the mustardy aroma of brussels sprouts? You’ll love this fun twist on quick pickles, perfect to serve as a side with mashed potatoes, roasted squash, or on a platter with soft cheese and rustic bread. In a stainless steel pot, bring the water, vinegar, and salt to a boil, then remove from heat. Place 2 garlic clove halves and a few whole black peppercorns into each jar. Then stuff each jar tightly with clean, halved brussels sprouts. Carefully pour the brine over the brussels sprouts until they are completely covered (all the way up to the brim). If needed, poke any sprouts back under the brine until they’re covered. Screw on the lids tightly and give them a few shakes to mix the ingredients. 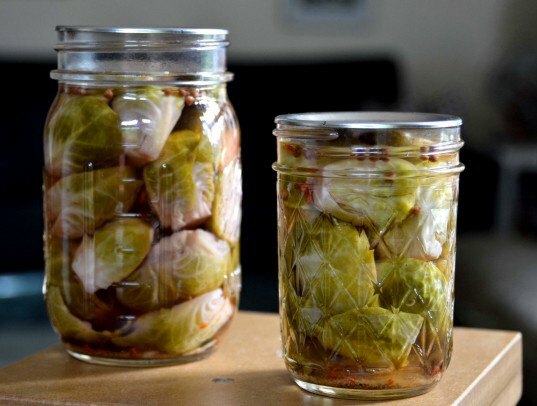 Refrigerate your sprouts for at least 24 hours then enjoy! They’re best eaten in a few weeks, and do keep them in the refrigerator. Though they have vinegar and salt, they’re not canned so they are not shelf-stable. This moist, delicious cake has more apples than most recipes. The addition of cardamom highlights this unusual and savory spice. This one is made with Greek yogurt and olive oil to make it healthy and light. Preheat the oven to 350 degrees Fahrenheit. Beat the eggs until light and frothy, then beat in sugar. Add in vanilla, bourbon, yogurt, and olive oil. Combine dry ingredients (flour, baking powder, salt, and cardamom) in a bowl, then gently mix into wet ingredients. Once well-mixed, fold in diced apples. Pour into a greased 8×8 baking dish. Place baking dish into the 350 degree oven and bake for 35 minutes. Let cool then slice and serve. 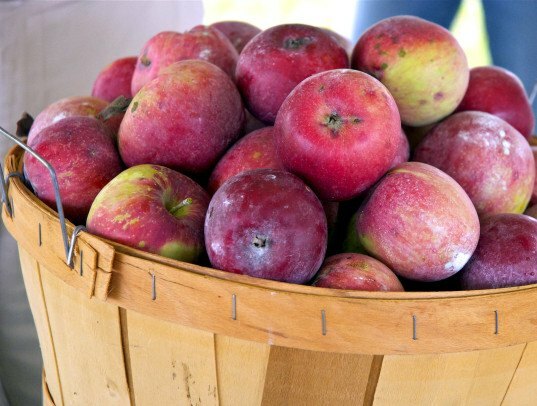 Fall is in the air and seasonal fruits and veggies like pumpkins and apples are available once again in grocery stores, farmer's markets, and CSAs. If the season makes you think of warming spices like cinnamon or curry, you'll enjoy whipping up these 5 delicious plant-based recipes that make the most of autumn's bounty. 1 cup pumpkin puree (either canned or make your own by roasting a split pumpkin with cut sides down at 350 until soft - about one hour - then scoop out puree and mash it). Preheat the oven to 400 degrees Fahrenheit. Mix the dry ingredients together in a large mixing bowl (flour, salt, cornmeal, baking powder and baking soda), then make a small hole in the dry ingredients. Into the hole, add the wet ingredients (eggs, olive oil, honey, pumpkin puree, milk) and gently mix together the batter. Finally, fold in the corn kernels. Grease or butter an 8x8 inch square metal or glass baking dish. Pour the apples into the dish and squeeze a bit of fresh lemon juice over them. Sift the dry crumbly mixture evenly over the apples. This warming golden soup has just enough spice to kick up your metabolism and keep you toasty on cool fall nights. Savory Thai spices combine with buttery squash for a hearty soup that you can make a meal out of by serving with a side of rice. Step Two: Prep Soup In a large soup pot, sautee red curry paste, ginger, onions, and garlic in olive oil. Once softened, lower heat and add 6 cups of water and the 2 bouillon cubes (or paste). Mix until dissolved. Add the squash and can of coconut milk (reserving three tablespoons) and stir. After cooking for 1/2 hour, use an immersion blender to puree the soup, otherwise puree in batches in a blender. Step Three: Serve Soup Taste test the soup and add salt to taste, mixing well. Ladle soup into serving bowls and drizzle with the reserved coconut milk, then top with a sprig of cilantro. Love the tang of pickles and the mustardy aroma of brussels sprouts? You'll love this fun twist on quick pickles, perfect to serve as a side with mashed potatoes, roasted squash, or on a platter with soft cheese and rustic bread. Step Three: Fill Jars Place 2 garlic clove halves and a few whole black peppercorns into each jar. Then stuff each jar tightly with clean, halved brussels sprouts. Carefully pour the brine over the brussels sprouts until they are completely covered (all the way up to the brim). If needed, poke any sprouts back under the brine until they're covered. Screw on the lids tightly and give them a few shakes to mix the ingredients. Step Four: Refrigerate Refrigerate your sprouts for at least 24 hours then enjoy! They're best eaten in a few weeks, and do keep them in the refrigerator. Though they have vinegar and salt, they're not canned so they are not shelf-stable. This moist, delicious cake has more apples than most recipes. The addition of cardamom highlights this unusual and savory spice. Even better, its made with Greek yogurt olive oil to make it healthy and light. Step Two: Mix Batter Preheat the oven to 350 degrees Fahrenheit. Beat the eggs until light and frothy, then beat in sugar. Add in vanilla, bourbon, yogurt, and olive oil. Combine dry ingredients (flour, baking powder, salt, and cardamom) in a bowl, then gently mix into wet ingredients. Once well-mixed, fold in diced apples. Pour into a greased 8x8 baking dish. Step Three: Bake Cake Place baking dish into the 350 degree oven and bake for 35 minutes. Let cool then slice and serve.